Englewood Cliffs, NJ (October 16, 2014) – Maserati North America, Inc. today announced it will celebrate Cento anni di Maserati- 100 years of Maserati- in true Italian style. This epic series of driving events to honor the Trident’s 100th Anniversary will take place in key cities across America. Maserati owners and enthusiasts will be drawn from across the U.S. to showcase their finest automobiles at this significant centenary milestone. Approximately 100 owners are anticipated at each event, signaling the largest gatherings of Maseratis on record in the U.S. Each Cento anni di Maserati rally will include a historically-significant bridge or landmark on the driving route, bridging a century of manufacturing to life. Each monument will serve as a symbol of the Trident’s journey to America linking Maserati’s history from the past into the future. 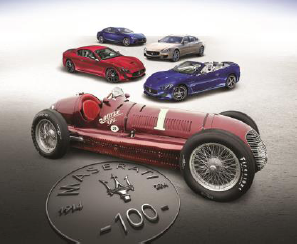 The centennial-themed driving series celebrates both the illustrious history of Maserati together with the passion of its clients in North America. Participants who share their passion for the Trident will drive their own Maserati- old or new- on a specially prepared route that brings the spirit of Italy’s most revered marque to the streets of the U.S. The series kicks off Saturday, November 1st at the Italian Embassy in Washington, (D.C.) with drives to follow in Miami Beach (FL), Los Angeles (CA) and culminate with a private opera experience courtesy of the Teatro Regio Torino of Turin at the Chicago (IL) Harris Theater. Guests embark on a scenic drive across Chain Bridge, George Washington Parkway and Rock Creek Parkway. During the route, guests will pass the famous Arlington Memorial Bridge and see some of the capitol’s most iconic buildings. This parade of Maserati vehicles will end with a VIP reception at the Italian Embassy, allowing the guests to embrace the Italian history and culture. To tribute to unique design, the Miami event will begin at the Pérez Art Museum Miami which is home to contemporary and international works of art from the 20th and 21st centuries. Guests will enjoy light hors d’oeuvres, coffee and espresso before driving across the MacArthur Causeway and through Ocean Drive to arrive at the Miami International Auto Show for exclusive press access. Maserati centennial celebration will start at the renowned Santa Monica Pier where guests will revel in the history of this 100- year-old landmark before parading to the Los Angeles Auto Show for a VIP reception and at the Maserati display where the Alfieri concert car will be on display. The grand finale of the Cento anni di Maserati will begin with a reception at the Pritzker Pavilion followed by a special Italian opera at the Harris Theater for the North American debut performance of the Turin, Italy-based Teatro Regio Torino orchestra and chorus. Under the leadership of Music Director and Conductor Gianandrea Noseda the Teatro Regio will play the iconic and vibrant “Wilhelm Tell” by Gioachino Rossini. In December 1914, the Maserati brothers Alfieri, Ettore and Ernesto Maserati opened their first workshop in Bologna, Italy, and throughout 2014, Maserati has been celebrating its birthday in style all over the world. Cento anni di Maserati will conclude this global birthday party and showcase the finest of Maserati automobiles, both vintage and new, fueling the Trident for its next 100 years. Complete owner registration details for the Washington, D.C., Miami Beach, Los Angeles and Chicago events can be found at www.maserati100years.com. Maserati produces a full line of two and four door models legendary for their spacious handcrafted luxury, thoroughbred performance and everyday usability. The Maserati range includes the all-new full-size Quattroporte and the mid-size Ghibli sport sedan, which earned a 2013 Top Safety Pick from the Insurance Institute of Highway Safety (IIHS)*. The flagship Quattroporte GTS leads the charge with a 523 HP twin turbo V8 while both the Ghibli and Quattroporte are available with All-Wheel-Drive, a competition bred twin-turbo 404 HP V6 and an adaptive 8 speed automatic transmission. The two-door GranTurismo line continues with several variants of coupes and convertibles that combine elegance and comfort for four adults, with a 6 speed automatic transmission to keep the legendary Maserati performance and exhaust note close at hand. Maserati automobiles and merchandise can be found at authorized retailers across North America. Information on Maserati can be found at www.maserati.us for the U.S. or www.maserati.ca for Canada, 1-800-My-Maserati. *Built after November 2013.